Most of my life, I've never had a good image of Rochester. As a boy, my father would make trips there, usually in the winter, talking about how he loathed the drive from Philly (a good 6 hr hike) as well as the bitter winds off Lake Ontario. My two younger brothers helped confirm it when they went up a couple years ago for business purposes, not speaking highly of their time spent in the city. Thus, when I planned on meeting some pals from Bozeman, MT for lunch and coffee in Rochester, I wasn't thrilled. I did my homework and found little promise of decent coffee where I was headed and to top it off, I only had a limited window to catch up with my comrades so I planned on not worrying to much about finding decent java. So after finding my caballeros east of Rochester, I followed them and a friend of theirs (a local) into the city of Rochester, a change from our original plans to eat where we had met outside the city. 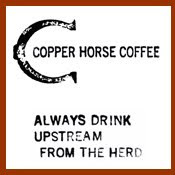 I didn't really pay much attention to where we were headed as I was busy chatting with a good friends, one of whom had become a barista after I last saw her and totally lost herself in the search for coffee wisdom (that and she's a chatterbox :) ). Eventually we found ourself off of East Ave on a hip-looking row of restaurants and shops. Still not thinking we'd find a good coffeehouse, I stood mouth agape when I noticed a sign that said "coffee roaster" when I got out of the car. We walked past the sign hung on the side of the Spin Caffe on our way to get lunch down the street at a Mediterranean place called Sinbad's, where my friends enjoyed sumptuous pitas and I suffered through a wickedly vinegar-ized cornish hen and parsley salad. Of course on the way back we stopped at the Spin Caffe, especially with my one barista friend and another buddy who had recently dove into the world of coffee roasting (it appears he's self-taught himself well). The exterior was nothing too exciting; lots of plastic lawn furniture surrounding the brick building that boasted a really nice big storefront window. The interior was much nicer, with a variety of chairs and tables surrounded by some nice decoration with a clever spinning theme. Spin Caffe roasts their own coffee, which upon some minor study looked fairly well-roasted. I ordered the Mexican Organic, a light roast which seemed a bit too light as I sipped it, proving somewhat bland yet with some minor earthiness to it. The espresso seemed decently pulled and the shot tasted fairly sweet with a nice acidity, though it had a hint of cardboard on the back end. My friends added a little bonus feedback: my friend's (the barista) latte was poorly presented (milkshaky) and my one non-coffee-crazy-but-loves-mochas pal really liked his (just the right amount of chocolate). I noted the kinds of teas and they seemed to be all free leaf but I'm not 100 percent sure. 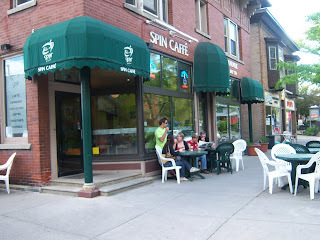 Overall, I have to say I sit on the fence regarding Spin Caffe. 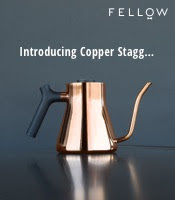 On the one hand, they seem to have it together roasting-wise (despite the bland coffee, something I've had at amazing places too) and a decent espresso operation. On the other hand, they seem like they need a little more refinement behind the espresso machine. I guess I will have to make a few more trips before I know for sure. In the meantime, if you have any wisdom or experience with the place, please do comment. Hello Bill. I am Ron Cortez an Arizona coffee roaster and i loved your review of Spin cafe. I agree with some of your comments. they roast using a 15 kg. Sasa Samiac; a french coffee roaster that seems to be one of the best in the world. I know that Randy Orland the owner will llove to know that you commented on his place. Visit us next time you are in Phoenix.